Are yo looking for affordable, personalized folded holiday cards? PGprint produces high quality printing in full color, and you can print as few as 25 cards. You can also choose from two different styles of envelopes, square flap or pointed flap, to suit your design tastes. Extensive catalog of online design templates! Impress your friends with professionally printed, personalized folded holiday cards from PGprint. 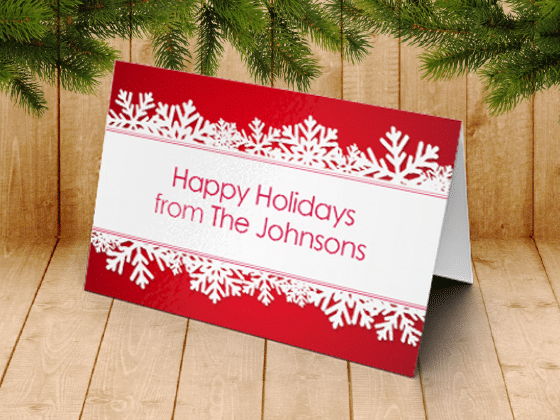 We will produce your cards with crisp images in full color with our online folded holiday card printing services. Let your imagination take flight! PGprint provides you with a wide variety of options for paper and finished sizes, as well as color options and full bleed at no extra cost! Holiday card printing is now much easier with PGprint. Through our printing services, you can select from one of our templates, or upload you won artwork and we will print it for you. The high quality printing, fast turnaround, and affordable prices at PGprint provides the value you expect and the quality you deserve. Excellent customer service, delivered on time and awesome quality results of my cards! The only only thing I would change is the shipment price; is a little expensive for my budget.